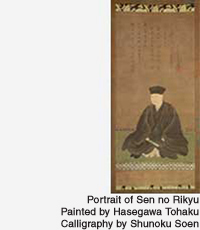 Rikyu is known as an important figure, not only in the world of chanoyu, but in Japanese history. Born in Sakai, he learned chanoyu from an early age and made a name for himself as a tea practitioner, finally becoming tea master to the most powerful figures of the age, Oda Nobunaga and Toyotomi Hideyoshi. He was at the centre of Momoyama culture, and also played a political role as an aide to Hideyoshi, doing much to establish chanoyu's position within Japanese culture. Rikyu's chanoyu has been written about by many people. One of Rikyu's leading disciples, Yamanoue Soji, wrote the 'Yamanoue Soji Ki', and on the occasion of Rikyu's 100th anniversary, in Genroku 3 (1690) the 'Nanpo Roku' (Southern Record) was completed, these being known as early materials relating to Rikyu's chanoyu. Then in Showa 15 (1940) around the time of Rikyu's 350th anniversary, various studies of Rikyu were published. Also, in recent years, at the time of Rikyu's 400th anniversary, there was a large-scale 'Sen no Rikyu exhibition' at the Kyoto National Museum. At the same time, movies were made about Rikyu by the directors Kumai Kei and Teshigawara Hiroshi as interest in Rikyu increased outside the world of tea also. It could be said that the course of chanoyu since the time of Rikyu 400 years ago largely derives from him. The fact that chanoyu is now one of the representative elements of Japanese culture that has been embraced by the people is also due to the care with which the tradition has been passed down. Here we will spotlight Sen no Rikyu, his life and chanoyu, and also the way that this tradition has been handed down to us, focussing on the successive Iemotos of Omotesenke.